('Rotmantel’ = red coat) Among the easiest plants to grow, Hen-and-chicks tolerate heat, drought and neglect with style. 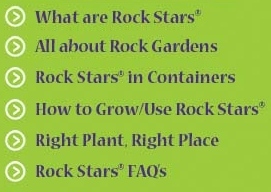 Useful in rock gardens, container garden of all types, rooftop gardens and rock walls. Hundreds of varieties exist. All types form a low cushion or carpet of fleshy leaves, tiny new plants appearing in a circle around the mother in the middle. This selection has medium-sized star-shaped rosettes of apple-green leaves tipped with red. Short spikes of pastel flowers appear in summer. Easily increased by just removing the small baby rosettes and replanting in a new location at almost any time. After flowering, the mother rosette dies to leave room for the chicks: remove this by tugging gently at the base of the bloom stem.